L.A. Larkin’s third thriller takes readers back to Antarctica, the setting of her last novel Thirst, but with a new cast of characters and a new global threat. But Devour doesn’t get to Antarctica straight away. Larkin opens in Afghanistan where investigative journalist Olivia Wolfe is tracking down information about a terrorist cell. So while there is a lengthy detour to Antarctica to set up the action this is a globe-trotting thriller that also manages to take in both the United Kingdom and United States. Wolfe is sent to Antarctica by her editor after a disastrous mission in Afghanistan to both give her some distance (literally) and to explore some strange goings on at a British research base. The researchers are using some new technology to drill down to a previously untouched lake that lies under three kilometers of ice. The British mission is also a race against time as a group of Russian researchers are trying to achieve the same objective. But a series of accidents, including the death of one of the team, has given rise to suspicions of a traitor in their midst. Under the guise of a journalistic piece Olivia flies in to investigate. But there is more going on in Olivia’s life than just this investigation. First person point of view chapters make it clear that she has a mystery stalker, someone obsessed with her and has been able to infiltrate both her flat and her life. This stalker throws complications into the initial investigation and continues to throw spanners in the works after Olivia returns to the UK and the action heats up. In the end, this is a fairly typical techno-thriller. There is a highly destructive Macguffin which poses a global threat, a range of dodgy suspects, a hunky Russian love interest who Olivia is not sure she can trust and a high stakes climax. Larkin does a good job of ramping up the tension and while the addition of the stalker element is a little over the top it does greatly add to the level of difficulty for Wolfe. While there is nothing particularly new here this is still a great ride for thriller lovers. The action moves quickly enough that it is easy to ride straight over the plot holes without falling in. 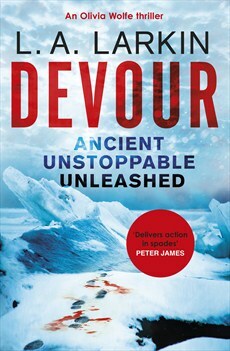 And Devour stands out through its atmospheric section in Antarctica, a vulnerable but resourceful, kick-arse female protagonist and a just slightly less than serious Australian sensibility. And with the stalker identified but still at large at the end of the book there are clearly more Olivia Wolfe exploits in the wings.